June 2013 – He Said What?! Aaron has been in a good mood for the past few days, and that’s always a blessing. While in a pleasant mood, Aaron likes to talk. I mean, we know that Aaron always likes to talk………but these happy moods promote lots of talking. I mean, LOTS of talking. The other morning, he and I were on our way to meet his group. I had told him that if we could leave early, we would stop by the store on our way and let him pick up a drink and some Pringles. This promise only promoted Aaron’s happiness, which in turn pepped up his talking. And with Aaron’s powers of observation, he finds many topics on which to expound. In other words, I was in store for a verbal marathon………talking……..LOTS of talking. He had already been in and out of my room all morning, going on and on about the usual…….his latest movie of the upside down ship and can ships really go upside down and what would happen if they do……..about aliens and his Star Wars game and why he can’t have the Alien game that he’s seen at Wal-Mart and what’s wrong with guts and gore anyway…………about cloning and can humans be cloned…….and about Jackson and why can’t he have some of those peanuts or whatever else Aaron is eating and why is Jackson downstairs instead of upstairs……..and I said that maybe Jackson wanted some peace and quiet as I almost told Aaron that I wanted some peace and quiet, too……….but I didn’t. There was much more than that, but you get the idea. We piled in the van for our short drive to meet Aaron’s day group via Dillon’s to pick up his drink and his Pringles. Of course, Aaron immediately noticed the tiny lady bug on the windshield of the van. “Mom! Have you heard the legend that if you count a lady bug’s spots then that tells you how old they are?” Why is everything a legend with Aaron? Anyway, we discussed this particular legend as we headed to Dillon’s, with me trying to balance listening to the CD Aaron had turned on along with this unending lady bug spots discussion. I finally gave Aaron the standard answer……..google it! And Aaron said he did and I don’t believe him. We pulled into the Dillon’s parking lot, where we parked in a spot where a woman was unloading her groceries right beside us. Aaron carefully followed my reminder to be careful as he opened his door, and then profusely apologized to the woman as she smiled and nodded her head……and listened to Aaron repeat his apology as he scurried after me into the store. He happily chose his grape Gatorade and then barreled ahead to his now familiar chip and snack aisle. His talking had lessened now because he was focused on the task at hand…….which was to beat Mom to the chip and snack aisle. As we rounded the corner and began walking up the aisle, I laughed quietly as I watched Aaron pump up his stride. We were in our own little make-it-to-the-finish line rush as he tried to beat me to the goal……..the Pringles!………..where he hoped to scoop as many canisters of Pringles into his arms before Mom got there to stop him! He was reaching for his third can of Pringles when I stopped him at two, and he decided that two was better than none and he compliantly agreed. As we headed for the self check-out lane, I reminded Aaron to be careful of the little child that was nearby and of the other shoppers and of the displays………because Aaron was only thinking of the Pringles and the Gatorade and paying for them and leaving the store. These hindrances in his way were not important to him. And he was thinking of white cheese. He had seen the white cheese Cheez-Its and asked me if I liked them. As I was trying to pay for his items, he was still talking about white cheese. On and on he went as I tried to concentrate on what was important at that moment……and white cheese was not on my important list. My important list involved reminding Aaron to stand right beside me and not wander off, where I knew I would find him punching the buttons at the empty self check-out register…….or punching buttons at the ATM machine nearby………or sitting in an empty chair at the Starbucks area, staring at the worker there as she asked him what he wanted and rubbing his hands together in glee as he would say, “I don’t want anything! I’m just waiting on Mom!” I gave Aaron the job of bagging his items after I scanned them. He continued with white cheese. Mom, what is white cheese? Have I had white cheese? Do you like white cheese? Aaron, bag the groceries. Aaron, turn around. Mom, why do they make white cheese? I don’t know if I like white cheese. Aaron, don’t remove the bags until I’ve paid. Aaron, put the bag back down. Mom, can we get some white cheese? I thought cheese was that yellow color. Aaron, now you can pick up the bags. Aaron, you can carry the bags. Mom, when did you say that I had white cheese? I think I heard that last comment from a distance as I beat him to the van. I had three seconds of quiet while he walked around and opened his door. I turned up the music a couple notches, but Aaron was not to be deterred. He had spied the karate business nearby, and so he quickly forgot all about white cheese as he excitedly talked about karate……..and breaking bricks……and who does that…….and would I like to break bricks……and why not. He talked about the old truck that was used as a display inside Dillon’s…….why was it used……where did it come from…..did I like it. And the jogging mom that we passed……..and the stroller she pushed……..and the baby in the stroller………and why did she push the baby. He saw the smoker in the man’s yard that we always pass…….and what was that chimney called?……….and why do people want a smoker. He segued beautifully to the bent house that we pass………and who lives there……and what does it look like inside…..and would I like to see the inside. Then there was the tent that had been set up in a parking lot……and why was the tent there…….and what would be in the tent. He talked about Andrea’s birthday coming up……and our trip to Texas……..and that he is staying home with Krysten. Then he saw more old cars in a driveway…….which led back to the old truck at Dillon’s…..and I felt that we had certainly come full circle as we pulled up to meet his ride. My ears took awhile to get rested after that morning full of Aaron’s very happy, and very prolonged, chatter. Then last night, just before he finally closed his bedroom door for the last time (I hoped), he remembered something important that he had wanted to tell me. Even the thought of that made my knees weak. He laughed at his funny joke, and I laughed at his funny joke as I agreed with him. Yes, Aaron, I would completely lose my nerve if there were two of you! I didn’t tell him that my sanity would be lost as well, no doubt. Yes, one of Aaron is enough………..more than enough. And on most nights as I lay my head on my pillow and rest my weary ears, I am thankful for our one Aaron. Our one and ONLY Aaron! Author hesaidwhatksPosted on June 26, 2013 Categories Adult Autism, Asperger's SyndromeLeave a comment on Cloning Aaron?! 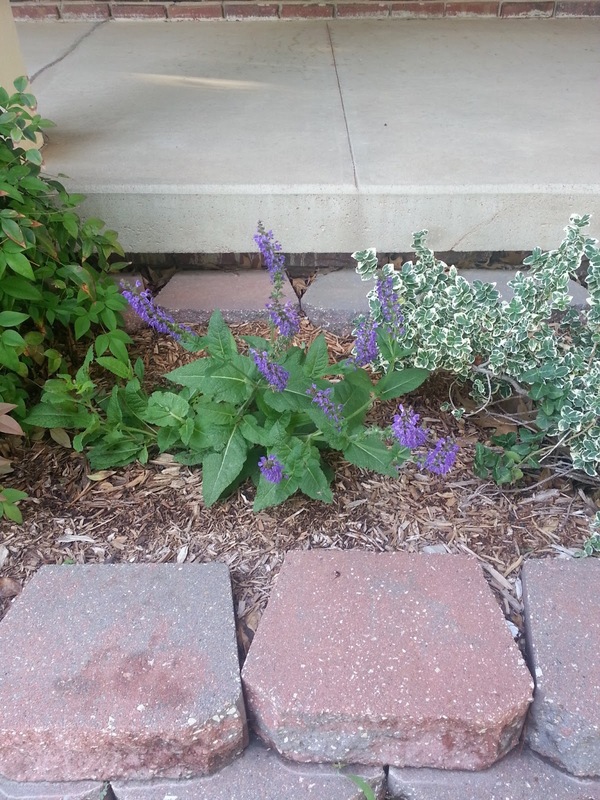 In my front flower bed that runs along our sidewalk, I have two Purple Salvia plants that have grown there for several years. Being perennials, they return every year to please us with their pretty purple flowers. However, I have noticed for a couple years that they are quite different from one another in their size. The one on the left of the bush that separates them is large and full. The salvia on the right is much smaller. This spring I watched them and saw that the same thing was happening. 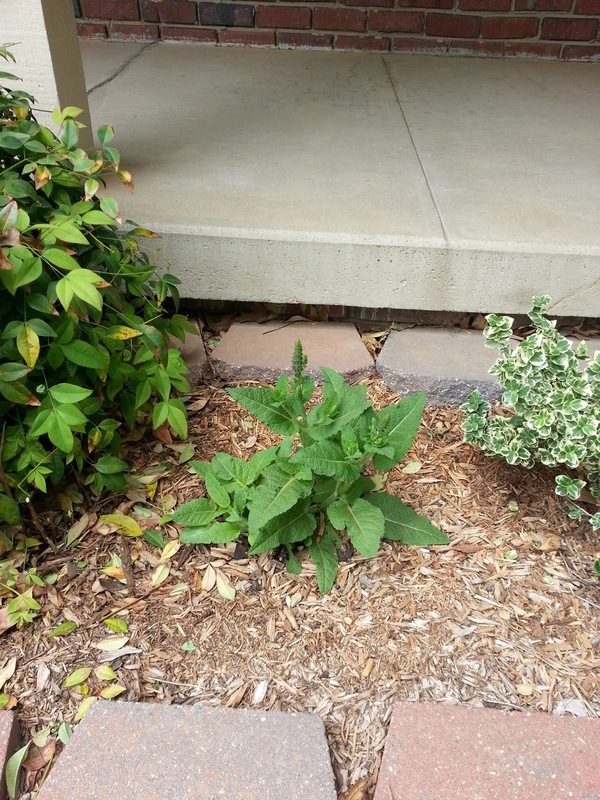 In fact, I wasn’t sure for awhile that the salvia on the right was even going to make its appearance. One day, though, I saw little green salvia shoots that were pushing through the soil and the faded mulch. It seemed to take forever for any significant growth to emerge. Yet there it came, slowly pushing upward from the soil. I watched the process continue. 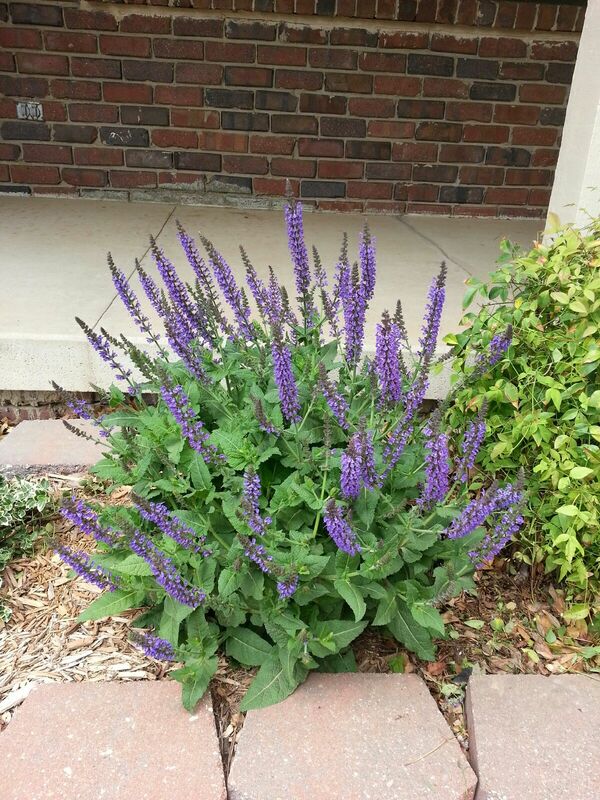 The poor little salvia was faithfully staying alive, but its sluggish growth could not be compared to the rapid, beautiful growth of its fellow salvia. The small salvia was just no comparison to its large companion. Seeing them nearly side by side, only separated by a small bush, only exaggerated their differences. The one salvia was full and healthy, exhibiting such pretty blooms that attracted bees and our attention alike. The other……….well, it was so puny and small that I stood one day staring down at it in pity………pondering whether I should just pull up the pathetic thing and plant a whole new salvia there. But something stopped me from replacing the struggling little flower with a new one. I saw that even though the growth was stunted, it was at least still growing. 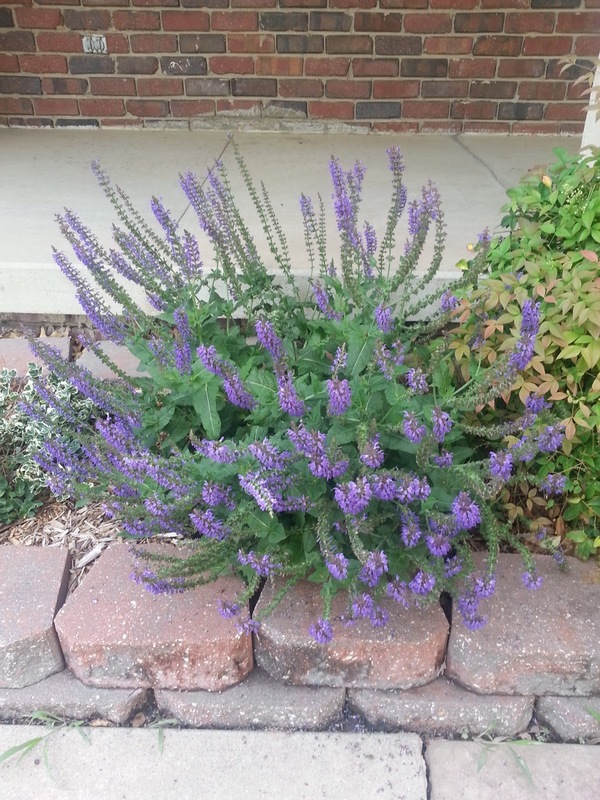 This slight salvia was persistent, not surrendering……….so how could I give up and just yank it from the ground and replace it with one that I deemed more beautiful? And as the days progressed, so did this meager salvia continue to grow. Then one day I saw them……the petite beginnings of blooms! Not only was my tiny salvia living, but now it showed the promise of flowering. Sure enough, it did just that. 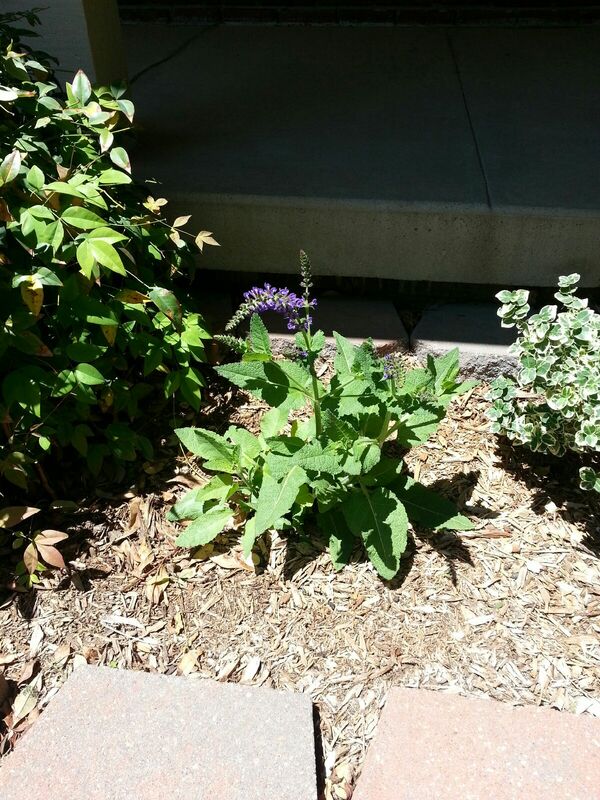 One morning I walked over to my little plant and found pretty purple blooms. How exciting! Oh, if I stepped back and compared the two plants to one another, the left salvia was still far more lovely……….all showy and bright. It was indeed an eye-catcher, whereas the right salvia was puny and unimpressive. Yet it was the lesser of the two plants that taught me the most. I realize that the ups and downs of my life…..and probably yours as well……can often be compared to that small little salvia. Sometimes we are that salvia on the left……….full of life and vitality in every area. We are effective and bright, useful in the lives of many people as we see the evidence of our gifts being used. But then comes a time when we find our effectiveness seemingly dwindled down to a bare minimum. For whatever the reason, we see ourselves and our service being replaced by others who shine brighter now. We have become that salvia on the right……..smaller and struggling……yet not without hope, because there is still life! So do you feel rather small today? Do you feel stuck in the corner or put on the back burner, while nearby there are those who are full of usefulness and beauty? It’s OK! God loves small! He brings us to these lesser times in our lives in order to teach us some very valuable lessons. Moses went from the palace to the desert; Daniel went from royalty to the lion’s den; David went from the king’s side to hiding in a dark cave; Job went from wealth to a time of unimaginable loss; Paul went from prestige to prison. And the most important example is Jesus Himself. Jesus did not think that his position as the Son of God was something to be grasped, so He took upon Himself the form of a servant (Philippians 2:5-8). Jesus……the Son of God…….royalty indeed……was born to a little virgin girl from the dismal town of Nazareth. Jesus……born in a dirty cave with animals all around and a trough for a bed. Jesus……..taken by Joseph and Mary to live in Egypt for several years of anonymity. Jesus……then raised back in Nazareth, that town of no reputation. Jesus…….a humble carpenter by trade. He walked the dusty roads and ministered to the least of these, not garnering a huge and faithful following…….but faithfully following the call of His Father. And He willingly suffered the most humiliating death of all……..the death that even Roman criminals were not made to endure………..the cross. A death so awful that it was performed outside the city. Jesus…….taking upon Himself our sin and being forsaken by God as he suffered our punishment. And then He walked out of that tomb, alive and victorious! Jesus humbled Himself, and so He often asks us, in our walk with Him, to be humbled. There are so many lessons to be learned during the time of smallness in our lives. It is often a prolonged time as God speaks to us and teaches us the particular things that He has ordered just for us. Yet what a time of growth it can be, if we don’t become impatient at the slowness of our progress. Just wait, and one day you will see a bloom…….a flower……..the promise of usefulness still ahead. Don’t compare yourself to the others who seem to be so much more beautiful and useful than you. Thrive in the place where God has put you, and bloom in the way that He has allowed. I’m so thankful that I didn’t pull up and toss away my scant and unimpressive salvia, for from that little meager plant I have once again learned a huge lesson! I’ve written about how Aaron notices people’s physical characteristics, and then refers to them based on that observation. Try as we might……..lecture as we do……over and over again, it makes no difference to Aaron. You remember how I told about Aaron thinking that all his drivers are from Africa, no matter their skin color, accent, eye shape…..doesn’t matter. They’re all from Africa to hear him tell it. Today when Aaron came home, we were having our usual discussion about his day. I asked him what he spent his money on since I saw that his wallet was empty. You try standing there and instructing Aaron with a straight face after that kind of statement. Somehow I did it…….and I should win an Oscar or Tony or Emmy or something. I just wanted to share my feeling of accomplishment tonight. I saw this picture today from the Autism Spectrum Disorder Facebook page, and thought of how very well it described my morning yesterday with Aaron. Aaron and I pulled in to Quik Trip yesterday morning. We saw what we thought was the familiar van that the staff often drives, but as I pulled near I saw that the driver was unfamiliar. Thinking that this was a new staff member that I had not met yet, I asked Aaron what her name was. Aaron said he didn’t know, which is not at all unusual. I’m surprised when he knows anyone’s name because names are usually unimportant to Aaron. We pulled up beside the van and Aaron rolled down his window. He leaned out toward this woman who was looking at her phone, and so she looked up and saw us with the rolled down window………and Aaron’s door opening at my urging. She lowered her passenger window and Aaron loudly said, “My Mom wants to know what your name is!” He was getting out of our van, juggling his two bottles of water, and was getting ready to put his water inside her open window and open her van door. She looked alarmed and said, “No!” And as she started pulling away, I saw the baby in the back seat and suddenly put two and two together. This was just a random mom who had stopped to do something on her phone…….and unfortunately for her, she had stopped near where we link up with Aaron’s ride every weekday morning. Aaron looked confused as he got back in our van. I was horribly embarrassed, and this mother was no doubt scared to death. I drove around to try to meet up with her again and explain, but I guess she saw me coming and so she pulled out of the parking lot. I just can’t describe how badly I felt about this………….how badly I still feel about this! Then to top it off, Aaron jumped out of our van and headed for the store, saying that he wanted a sausage biscuit. He was well on his way and it was useless to call him back, so I parked and went inside. There I found Aaron with two biscuits on the counter, holding three dollars in the air, and asking, “What about three?” He then turned and grabbed another biscuit from the warmer, oblivious to the frustrated shopper behind him……..and the puzzled cashier……..and his very already frustrated and embarrassed mother. I somehow managed to get him to take the two biscuits, and to pay the cashier who had the change ready and waiting, and take the free sandwich sample that was being handed out behind us, and to say “I’m sorry” to the cashier, and to repeat “I’m sorry” to the frowning customer behind us, and to get out the door and to our van, and link up with our for-real driver who was also having a bad day. I’m still thinking about that poor terrified mother. I wonder what she has told her husband and family and friends about her scary encounter? I’m still thinking about the irritated customer that was behind Aaron……….understanding her, and yet wondering if she had any compassion for unusual Aaron………..or his harried mother? I’m still thinking about the puzzled cashier, wondering if he has seen Aaron there before and if the look on his face was just that of a man who has seen it all in Quik Trip. I’m still thinking of the wide-eyed girls who were handing out the free sandwich samples as they observed this scene, unsmiling and confused. Usually I handle these situations with humor and much more ease than I possessed on this day. The situation with the young mother really unnerved me. My stomach was in knots for a long time, as if I had experienced something very disturbing. And I guess in a way it was just that……..unnerving for me and for her. But not for Aaron, of course. He immediately went about his normal day, wanting sausage biscuits and then talking non-stop until his ride came. But he became angry when I was telling Tim, the driver, about it……….and I realized that I was making Aaron feel like it was his fault, and that I was talking about him. Those are two things that he does NOT like………so I had another situation to make right before I drove away. I tried to regroup all day…….to not take it all too seriously. I know of many moms who have these same sorts of days, whether with special needs or not. We moms goof up, get embarrassed, become frustrated – but we just keep going, don’t we? We can’t quit our job or change positions…………we’re mothers for good…..and bad. In all these times, there are lessons to learn and mistakes that we hope not to repeat. I’m thankful that God is right there with His love that gives me comfort and His listening ear that hears my words……even the ones I don’t speak but that are in my heart. And God’s patience is the best example ever for me! I needed an extra dose of His patience yesterday morning. I imagine that God needs extra patience with me, too, on most days. God is the kind of Father to me that shows me what kind of mother to be to Aaron. Especially on those days when Aaron REALLY stands out! 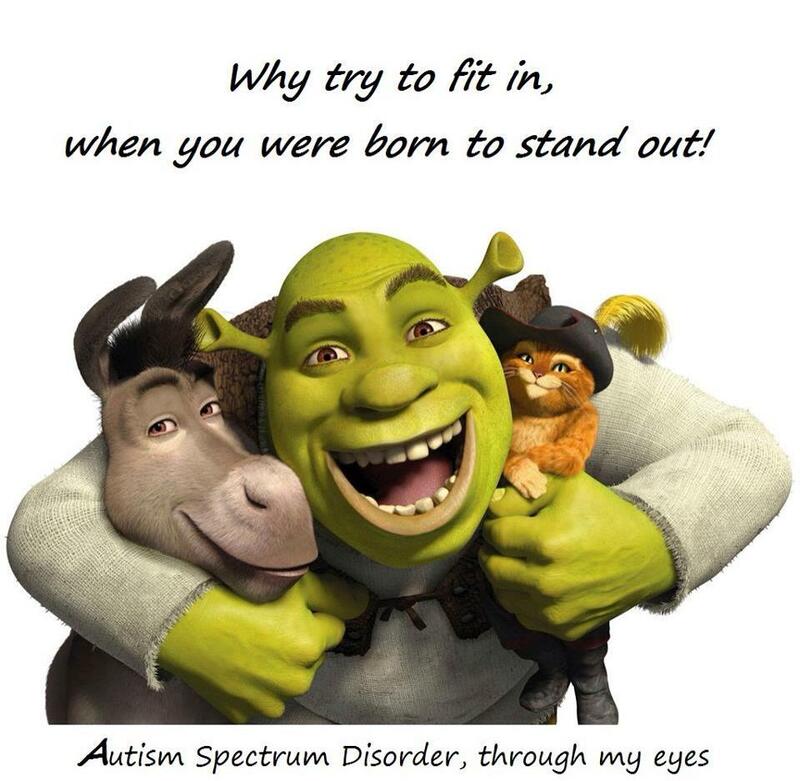 Author hesaidwhatksPosted on June 20, 2013 February 28, 2016 Categories Adult Autism, Asperger's SyndromeLeave a comment on Standing Out! Andrew, our youngest, has been home for a visit. He just left awhile ago for Missouri. It doesn’t matter how many times I say goodbye to him or to Andrea – I still get emotional. It’s just my mother’s heart, isn’t it? No matter how old they are, they will always be my children. I wouldn’t want them to sit here at home with me for the rest of their lives, but those goodbyes just don’t get any easier. With Aaron, it will be far different. Gary and I will someday need to make decisions about a group home for him. Aaron will probably resist that idea strongly, so much preparation will need to go into preparing him – and us – for that day. Believe me, there are days when we are more than ready to push him out the door! And then there are many, many times when we can’t imagine life without him here. The unique way that Aaron expresses himself is one thing that I would really miss. I can’t tell you how many tablet notes I have, or sticky notes, or random pieces of paper on which I have quickly written something unique that he has said. Here are just a few that I’m looking at as I write this. I sighed and told him that his covers were fine…….although I did notice that the top cover was a little crooked. And of course, so did Aaron. “But Mom, the blanket is kinda tipped a little!” And once again, despite my tiredness, he made me laugh. A tipped blanket! That will not do! I know. I’m still trying to figure it out, too. So I asked him what store that was. And he thought I was laughing because he said it was stinky. He bought Gary a Father’s Day card, picking it out all by himself. It’s perfect because it talks about calling Dad…………and Aaron calls us every single chance he gets. People have asked us if we ever plan to get him a cell phone. Not as long as we are in our right mind. 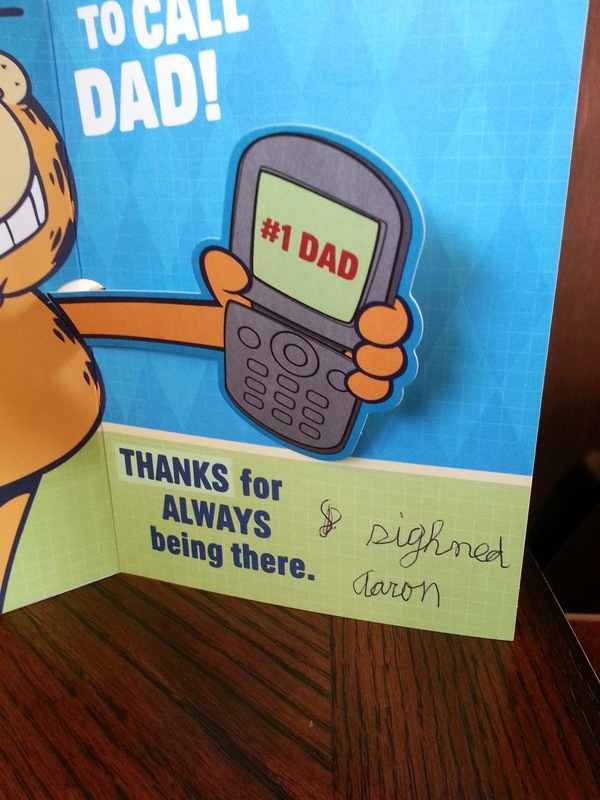 Not only full of emotion, but he took me literally when I said to “sign” the card……..and look at the spelling. I love it! My laughter when he’s already mad only makes him worse, so I waited until he left the room………and I laughed as I quickly wrote down what he said. He pulled himself together and was contentedly petting Jackson’s tummy when I went downstairs. Aaron was glad that I didn’t leave him alone as I stopped to get him an early lunch on our way to meet his group……..and listened to him talk and talk and talk about how he thinks Jackson’s nearly hairless tummy is creepy. Be careful what you wish for, Aaron. Sometimes those alone times aren’t all they’re cracked up to be. It’s a lesson for all of us, really. Author hesaidwhatksPosted on June 14, 2013 Categories Adult Autism, Asperger's Syndrome2 Comments on Are You From Africa?! I’ve written before about Aaron’s clapping. http://hesaidwhatks.blogspot.com/2011/11/clap.html He absolutely has perfected the loudest clap of anyone EVER! He will walk in a room and CLAP……..and our ears will ring. He’ll be sitting on the couch watching TV or a movie, and CLAP! And oh my goodness, I’m sure that a very big reason that he loves Wheel of Fortune is because this game show gives him permission to CLAP! We’ll be watching the contestants guess the letters, and of course with each correct letter the audience claps, and then Aaron’s eyes light up…………and CLAP!!! CLAP!!! CLAP!!! He is beside himself with excitement, and I am beside myself with frustration and near-deaf conditions. The other day as we drove to meet his group, Aaron whistled………….which is the second most irritating noise that Aaron makes. I told him not to whistle, just like I tell him not to clap. I need to just carry a sign and hold it up in order to save my breath. Aaron’s whistles are shrill……….as shrill as his claps are loud. My mind goes back to the blissful times when Aaron has had dental procedures and his mouth is numb…….and he can’t whistle. Much like the time that he broke his wrist and we had weeks……..yes, WEEKS………. of no clapping. Talk about the silver lining in the cloud! Really? And when did this happen? Like in the last 60 seconds? I do wish that he got sarcasm. My life would have so much more meaning if he did. Do you remember, Aaron, the two words you just used to describe clapping? You might say that, Aaron. Especially the shrill, deafening variety……which is your standard. And in an expression of pure delight, he leaned over and rubbed his hands together as he came to a conclusion. There are many reasons that I do not follow Aaron’s logic……….and this day I simply chalked up another one. He follows his own meandering paths to come to his conclusions, but he comes to them……….at least in this case………..happily. And obliviously (that word again) unaware of the look on my face.